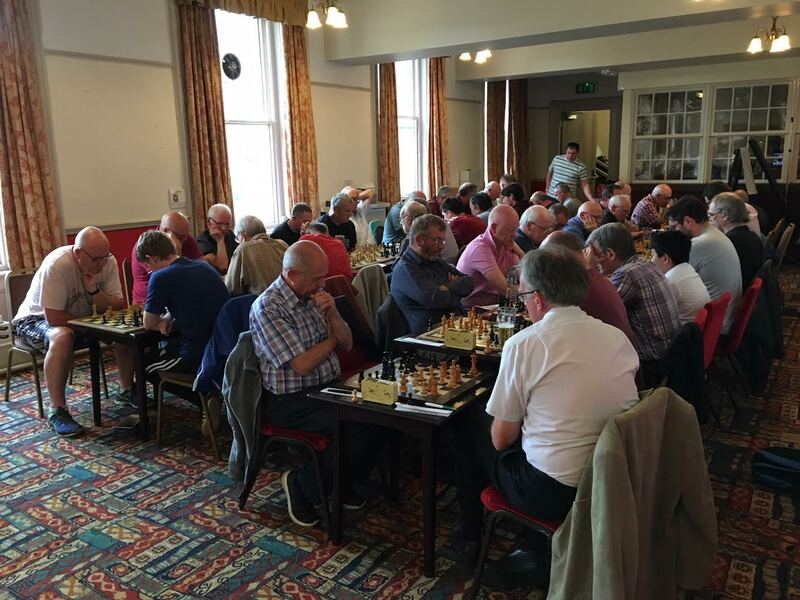 On Tuesday the 19th of June 22 players from Chester Chess Club met 22 players from Wallasey Chess Club at the Town Crier in Chester. This challenge event has has been held annually during the close season of recent years and this year reached its 10 year milestone. As always the match was hard fought and Wallasey as seems to be the trend surged into an early 5-1 lead. As the evening progressed Chester gradually eased back into contention and late on went into the lead. The match was finely poised at the point when Chester were two up with three to play. 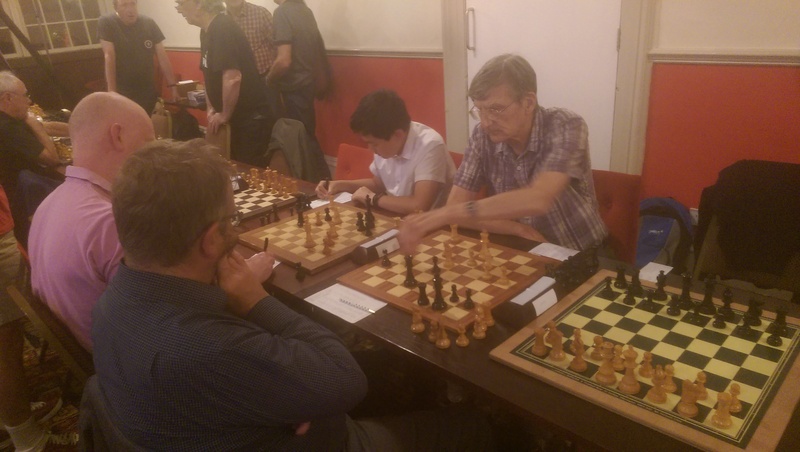 Of the three games that were still in play Jack Yang was clearly lost and Jo Nemcek faced a difficult defence a pawn down in a minor piece ending. Fortuitously for Chester Rob Killeen emerged victorious and thus Chester clinched the match. 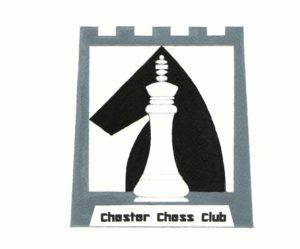 The final result was 12-10 to Chester, a result comprising of 10 wins, 4 draws and 8 losses. With this result Chester have pulled one back in the series but still remain 5-4 down to Wallasey. Here is to next year and the chance to finally draw level in the series! At the AGM we reviewed the two frontrunners (A and B) and then commissioned Graham to design a third hybrid logo (C). Please vote for your favourite in the comments section or email Graham or Phil. We’ll finalise the selection around the end of June. 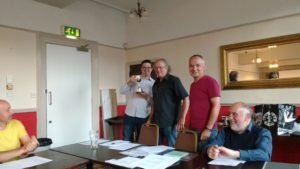 At the recent AGM we recognised a number of members who had extraordinary results in the last season. 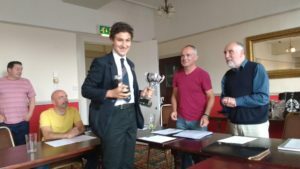 Well done also to John Carleton who was Chester and District League Division 1 Player of the Year, scoring 9 out of 10 on top board. And last but not least, Tony Rafferty scored an amazing 6/6 in division 4 of the Wirral League. The reports below are based on summaries from the captains. I took charge of each of the above teams over the season aware that we had set the bar very high in 2016/17 by lifting 3 of the 4 trophies that we play for. My [unstated] aim was to equal that attainment in the new season. It has to be admitted that 3 of the 4 trophies pose particular problems: these are A/ for the two Leagues we have our strength split, between 3 teams [out of 6] in the C&DCL and between 4 teams[ out of 9] in the Wirral C.L. and B/ the K.O for the C&DCL has a rather random handicap system, with it appears, little incentive to play a club’s strongest players. By comparison the Wirral K.O is more straightforward although we do not have a great record in that event. The Wirral League saw Chester A field only 3 reserve boards in the whole season and thus we generally looked solid throughout the 8 match campaign. We lost to Chester C early on who always look [and frequently are] dangerous against us. We were happy to squeeze past Chester B and Chester D so our season started reasonably. A loss to Malpas and Oswestry in January saw the league title effectively out of range but we opened up the race just a little by defeating the reigning champions Hoylake/ Great Meols against the odds in February. 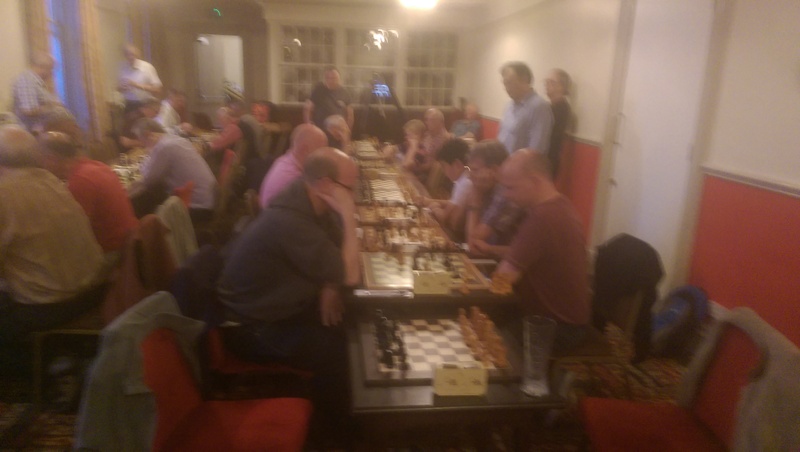 On this night the outstanding features were impressive Dave Robertson and Steve Connor victories “against the grade” and Dave Stuttard rescuing a draw from a position where he was 4 pawns and 42 grading points in deficit. 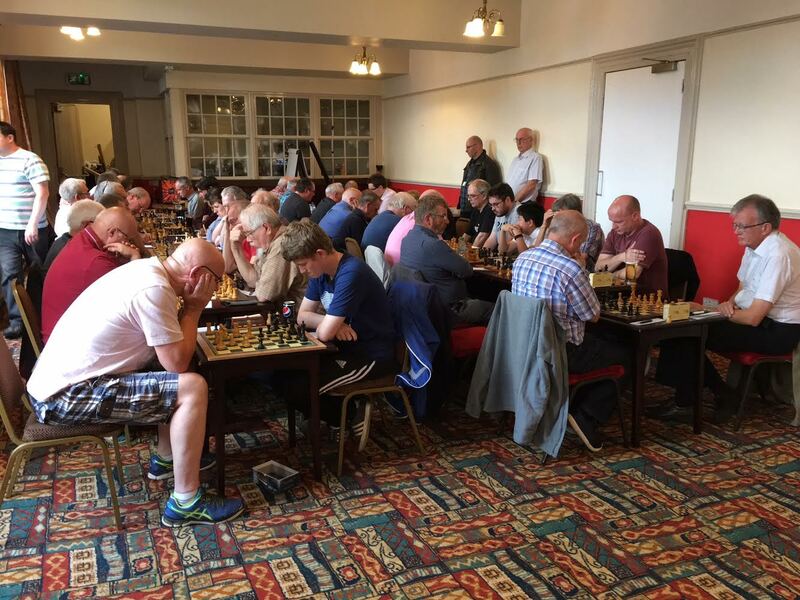 We played steadily throughout to finish runners-up to Hoylake and ahead of Chester B, C and D who occupied, in that order, positions 3, 4 and 5. None of our regulars scored less than 50%. Well done to Ray Williams who filled 2 of our 3 reserve slots and won both of his games. 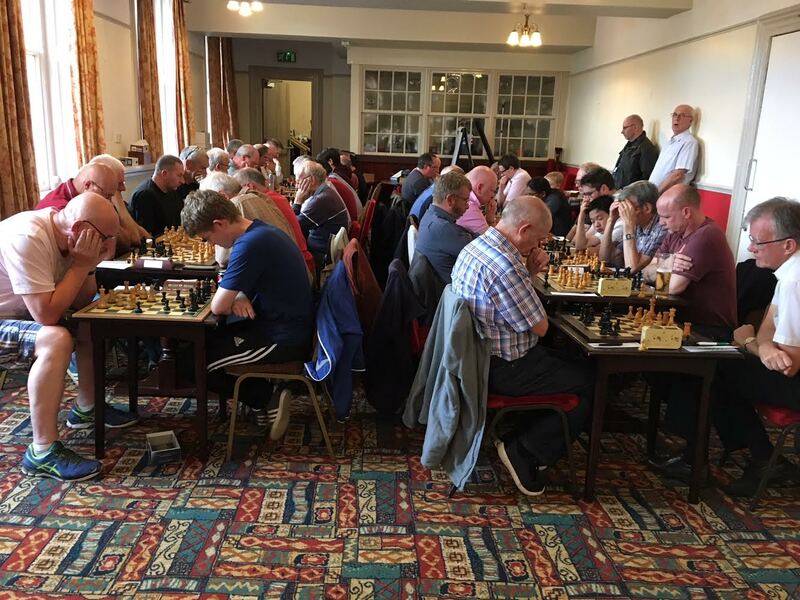 The Wirral K.O., as I implied earlier, can be more straightforward and so it seemed at the start of the competition. We went into round 2 with a bye in round 1 and victory by a flattering margin of 7-2.5 in October against Crewe saw us into the semi-finals to face Malpas and Oswestry in the second half of April [fixture congestion across the divisions caused the delay] . Malpas conjured up three ringers for the match including GM Keith Arkell’s brother Nick. In the event we finished the match powerfully to register a slightly fortuitous margin of victory by 5 points to 2. In the final Hoylake/ Gt. Meols fielded their strongest possible team but it seemed,had to find a some improvement to overcome our rating advantage. The match unfolded and seemed too close to call for most of its duration but suddenly,around the first time control, Hoylake cut loose and ran out comfortable 5-2 victors thereby completing a memorable league and Cup double. Next season we will need to set our stall out as we did this season but if the opportunity comes, finish the job in hand. The C&DCL division 1 started with a big reversal against Chester 2 for Chester 1 with Phil Crocker leading the way by crushing me on board 1. In recent years this competition has been very closely contested so we could not afford to get too downhearted. The response of the squad, which eventually consisted of 10 players was extremely positive. Three of the team were ever-present : Myself, Daniel and Dave Robertson were those players and we all scored 65% or more. Dave Stuttard with 5/7 was a regular too and also in good form. These figures were more than enough to firstly see our team establish ourselves at the top of the table and then subsequently run away with the title. Following our initial defeat we scored draws in each of matches with Wrexham and won the other 7, not without luck on occasion but mainly in fine style. Well done to all involved. I grabbed the P.O.Y. award for division 1 with more than one good examples of the luck referred to above. The C&DCL K.O. and its K.O. system provided some of our most tense fixtures. We were paired away at Rhyl and Prestatyn and for the first time in my experience we were unable to play our selected team because our opponents do not have disabled access. For this game our 13 player squad was stretched to the limit and Dave Stuttard stepped up to the plate to play his part in the relatively comfortable 6-0 [target 5.5 or better] result. I say relatively comfortable because our opponents created serious play in a couple of the games. Round 2, which was also the quarter final,saw us paired with Wrexham against whom we have had many close matches over the years. This time our target was 4.5 and with the top two boards in trouble, the onus fell on boards 3-6 . Daniel led the way with a speedy victory over Piotr Swiech but our other points needed a great deal of hard work. Colm managed to stay calm as his opponent missed a sacrificial perpetual check and gradually our man took the initiative to eventually win. 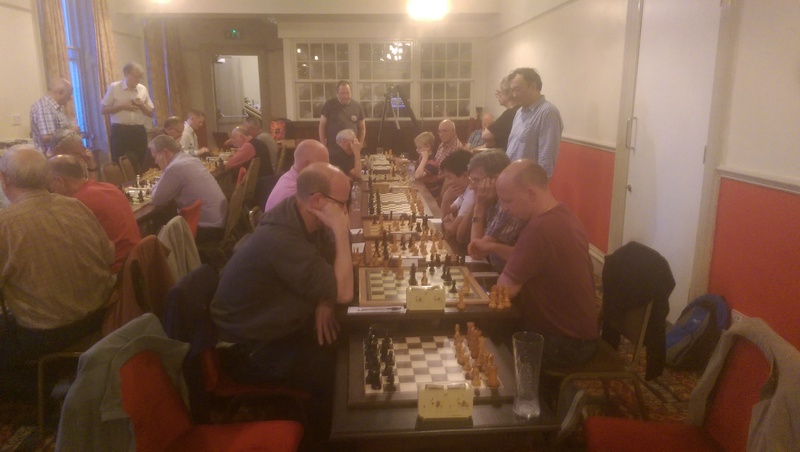 Rohan steadily built up a winning attack and on bottom board Dave Robertson somehow ground out a win from an exceedingly unpromising position. My draw on top board then gave us our minimum winning total. As ever this fixture was pulsating and tough.The semi-final was away against Colwyn Bay and we put Riyaan who had been “on the bench” into the team. Colwyn Bay left out one of their stronger players we expected, thereby raising our target from 4.5 to 5. This was a real tough ask but we stormed through 5.5-0.5 to meet Holywell who had defeated our B team in a close encounter in the other semi-final. We again played our top 3 juniors and a 6-0 result arrived after some pressure and with it the title of K.O. champions . Many thanks to our flexible and reliable K.O. squad throughout the season. You will see that there were a number of issues over the season and we hope that they will be resolved for next year by the fairly gentle diplomacy we have pursued. All in all, this was another good season with some good fighting chess the hallmark of our teams. 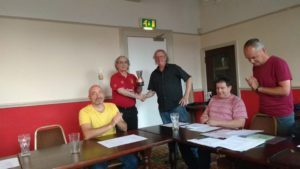 Chester 6 finished 3rd (again) with 8.5 points, winning 8, drawing 1 and losing 3. We were 2.5 points behind the champions, Malpas&Oswestry 2, but we did have the satisfaction of being the only team in the league to beat them. Chester 6 used only 6 players throughout the season. 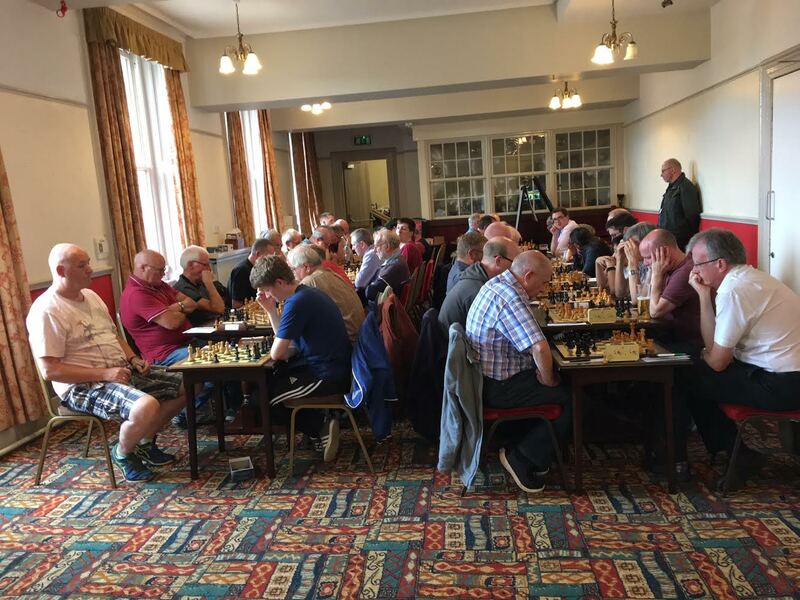 Chester E secured 5th place in Division 2, one place higher than last year, with 4.5 points, winning 3, drawing 3 and losing 3. Like last year, we used 9 players throughout the season. Chester K/O 2 again fielded teams in both C&D and Wirral leagues. In the C&D K/O we were given a bye in the first round and a walkover in the second round, which meant we were catapulted into the semi-finals facing Holywell. We out- graded Holywell, on all six boards, meaning we needed 4.5 points and Holywell 2 points under the handicap system. Holywell achieved their 2 points and went on to face Chester K/O 1 in the final. Congratulations to John Carlton’s team who had an even harder handicap to overcome but came out winners. 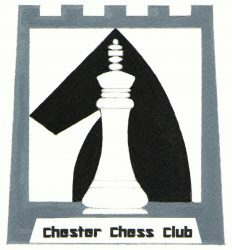 In the Wirral K/O, Chester K/O 2 played Buckley-Mold in the first round and were beaten 4:3. Thanks to all the players who took part in the team and K/O matches. A real mixed-bag of a season for Chester2. Having managed to beat both Chester1 (who finished champions) and Wrexham (runners-up) in the opening two matches we fared less well in our remaining campaign, but avoided the embarrassment of the previous season, when we ended up in last place, by finishing in mid-table. 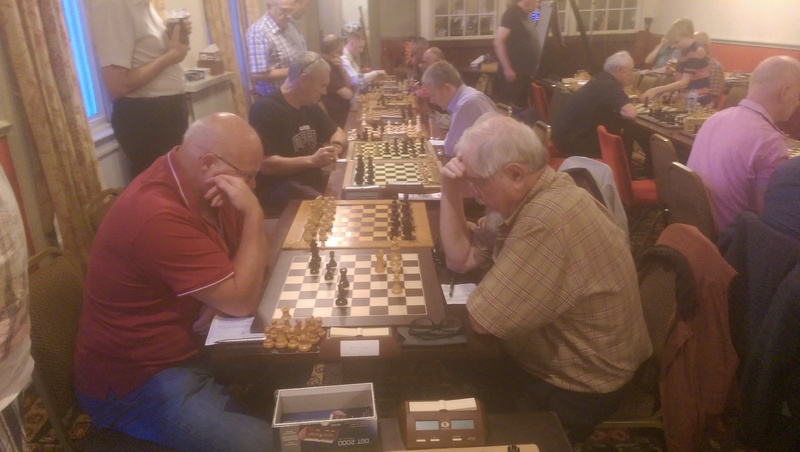 The highlight of the season was probably the defeat of Chester1 in which Phil Crocker inflicted a very rare defeat on John Carleton! In a very competitive Division 1 we called on 8 players. At the turn of the year only 1 match separated first place and relegation city. Highlight: Our relegation rivals [Malpas], we beat 9-1 over 2 matches. Team spirit and fighting chess was the order of the day from the off as all of our matches could easily have swung in either direction. Every player put themselves on the line for the team result over individual scores, even at the risk of losing even positions in order to gain match success. Rohan and Riyaan will be greatly missed next year and we wish them great success in their exams. Next season looks equally challenging and I’m sure our panel will be up for it again. Chester 4 finished fourth out of 8 teams in Division 2, having Won 7 Lost 6 and Drawn 1 match. All in all the team enjoyed a good season with a friendly spirit, despite the loss of John Sutcliffe after Christmas due to illness. I would like to thank Clive Tickell for standing in as captain during February and March while I was recovering from my knee replacement on the 12th February. The nearly ever presents were Clive and Joe who only missed one match each. 5 Division 1 players were used in 7 matches. Graham Bromley played on 5 occasions. Chester 5 survived its first season in Div 2 and that had been our principal aim. We finished equal 7th out of 8 but half way through the season we were 3rd. Our strength was greatly aided by newcomer Ian Mclean and a fine series of performances by Jixin Yang. The team has been fairly consitent through out the year which was an achievement in itself. Board 1; Manuel De Sousa, Board 2; Mario Scarpa, Board 3; Roberto Pino, Board 4; Phil Skippon. We finished 6th out of 10 in Division 3. If we are going to improve on this next year we need to find a higher rated Board 1 player as Manuel (120) was regularly playing against players rated far higher than this. Despite this he had a terrific reason with some very close matches. Mario had the highest success rate of the team with a win 55% of the time. We also had a large diversity of support players with John Harvey, Chris Fozzard, Claire Kerton, Tony Rafferty and David Bryan. We had a good season with 6 points from 8 games and were only pipped for second place on game difference. Star player was Phil Crocker (who is he?) with 6 1/2 out of 7. Dave Bryan and Chris Doran both chipped in with a useful 5 out of 7. An ongoing challenge was Rokas not playing in away matches. This situation is only feasible if Paul is able to step in and deputise. An additional player would be the best solution. Chester C started slowly. A disappointing loss against the Juniors was followed by a 4-1 hammering by the Bees. The only plus from that game was seeing on loan signing Jairo, a 2000+ rated FIDE player, beating Rokas quite convincingly on 2. The arrival of Jairo who had come over from Spain to study meant that with Colm, Mike, Jairo and Ben, we now had a top 4 boards that would rival most teams in the league. Indeed, we proved this by beating the A-Team at Hoole then winning on all five boards at home to Penyffordd. Jairo unfortunately couldn’t be involved in any of the matches after the new year (for various reasons), however Manuel and Keith stepped in and got respectable scores on 5. Any hopes of winning the league were ended when eventual champions Hoylake beat us 4-1 at home. However, things ended on a high with 5-0 thrashing of Wallasey 2 followed by a narrow 3-2 win away against a strong Malpas side. In the end we finished 4th, just 2 points behind Hoylake. A win against Hoylake would have meant the top 4 teams all finishing on 6 points each. 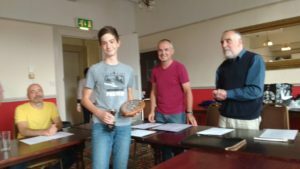 Pick of our players in the individual standings was Ben who was 7th best player overall, scoring 5.5/8, closely followed by Mike who scored 5/8. The 2017/18 season was a season of improvement as the Junior Team recorded their highest finish yet, ending 5th place above experienced teams such as Wallasey and Penyffordd while scoring a consistent 50%. Despite our small squad of 5 players with 2 reserves, we managed to field our top 5 boards every game, with the game against Wallasey the exception where Jack Yang was glad to help. 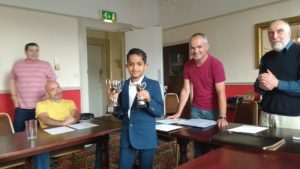 James and Riyaan deserve credit for losing just 2 games over the course of the season and Rohan, the standout player, finished on an impressive 6/8. As a new team which was just promoted to Division 2, Chester F did pretty well in this season. They finished quite surprisingly at the 4th place with 4 wins and 2 draws out of 9 matches. Although the captain Jixin Yang contributed most points, the success was more down to the two top boards used in this season (Ian McLean 3.5/6 and Rob Killeen 2/2). The performance from the two juniors Jack Yang and Abhijay Chawda is also satisfactory considering the strength of their opponents. Overall a tough season for Chester G, with difficulties raising teams for away matches resulting in some difficult nights, and a whitewash of our away fixtures. 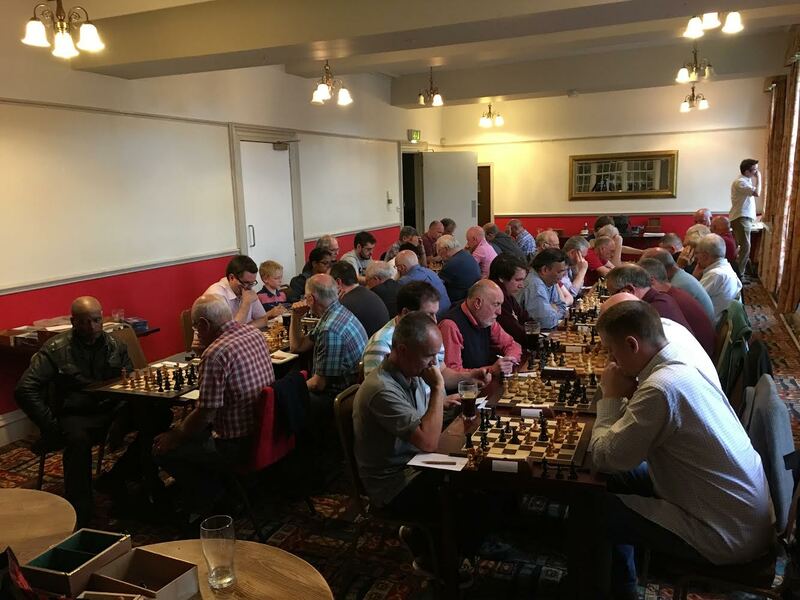 A more respectable mid-table finish may have been prevented by a clock malfunction on the bottom board in our game against Pensby – without a working clock, both team captains agreed to draw the game, and the match was a draw overall. 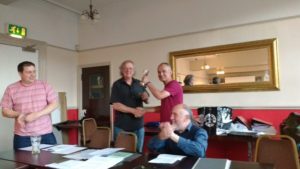 Our top player was Steve Williams with 4 out of 6, but I should also mention Manuel De Sousa, with a couple of important draws on top board. 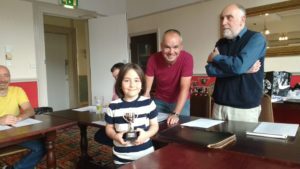 Unfortunately, my Townsend Trophy form didn’t carry over into the Wirral League, and I managed two draws and no wins. Of the three junior teams in the 4th division, only Chester L performed reasonably well, finishing in the middle of the table with 4.5/8 pts. Chester K managed only 3/8, and Chester J, last seasons champions, scored just 1.5/8 in what was a disappointing season. A total of 26 players played for the three teams throughout the season and Chester J and K were often well below their normal strength. I was however, very grateful that some of the up and coming juniors were happy to stand in and play for their club when they were required. The one stellar performance was that of Tony Rafferty playing on board 2 for Chester L who scored 6/6. There were also fine performances from Sam Burchett, (Chester L) and Nethuli Saram ( Chester K) both scoring 3.5/7 and both playing on board 1 for their team. 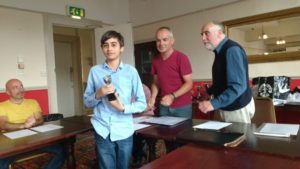 There were other good solid performances from Efe Kitis,2/4; Harry Rafferty, 3/6; Ben Woodfinden 3/5; and Milan Kustos, 4/7, all of which points to a bright future for Chester junior chess. Just one other statistic : Five adults played in the three junior teams last season.